Forest Trends works to promote investments, markets as well as other payment and incentive mechanisms for a broad range of ecosystem systems and services. Select a category to learn more. 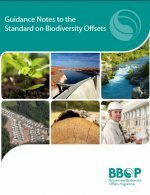 These Guidance Notes to the Standard on Biodiversity Offsets (‘the Standard’) have been prepared by the Business and Biodiversity Offsets Programme (BBOP) to help auditors, developers, conservation groups, communities, governments and financial institutions that wish to assess biodiversity offsets against the Standard on Biodiversity Offsets. We're proud to be recognized as a financially accountable and transparent organization. Copyright © 2017 - 2019 Forest Trends Association. All Rights Reserved.